... cue the Blackbird; followed by a Wren ... a short burst of song, shatteringly loud. The twinkling of distant cottage lights appear one by one on the hillsides like yellow stars, fallen from the violet, not-quite-black sky. Looking up a single brilliant diamond white star appears – the woods and fields are sleeping now, the earth slumbers. A shooting star - fizzes - a firework across the darkening sky. High up overhead a single Golden Plover calls as it flies over. Too high and dark to see. Lower down a few Brandt’s bats are hawking insects over the garden. Listening, thinking of nothing, simply living in the sound of the night, the world seems more alive; telegraph poles, weave their way drunkenly down the lane, stark black, throwing spooky shadows across silver-washed fields. A Barn Owl hunting along the edge of the wood - ghostly white. Somewhere a Nightingale1 sings - a virtuoso performance. A Robin sings from an elder in the hedge under the light of the street lamp. A Blackbird joins in momentarily; another Owl hoots. A Sedge Warbler bursts into song from the marsh across the way. Dawn approaches ... creeping shadows of light. A Raven croaks; another joins in. An early morning fisherman - a Grey Heron - perhaps disturbed by the Raven flies up ungainly from the brook in the valley, with a harsh, angry, 'fraank', fraank'. 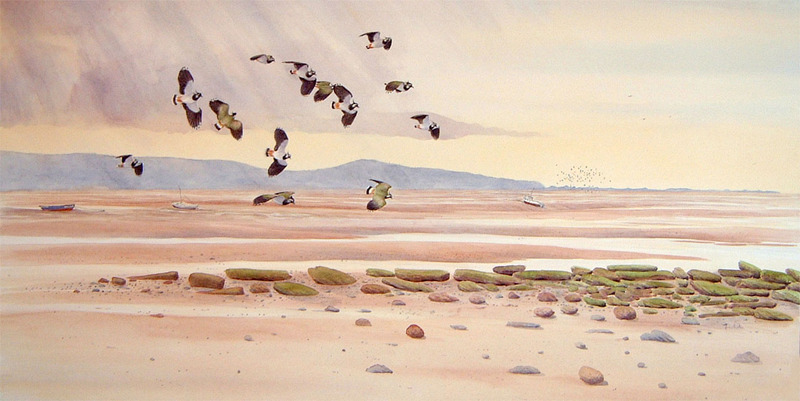 A loose skein of Canada Geese fly over on their way to the estuary mudflats. A pale cerulean-blue sky – crisscrossed with misty white vapour trails of planes – a modern art canvas; paint casually, thrown from the artists brush; white clouds tinged salmon-pink hanging over the blue-grey hills; just before sunrise – white wreaths of mist lingering over the fields mirroring the vapour trails above. Inspired by the writings of Richard Jefferies and W H Hudson. Mostly all my own words some of which have appeared in previous posts but pulled together as one here, except the following phrases (italicised) ... which were written by Martin Smith blogging as Foxxmetamatic, in his Diary of Hut Wood - https://hutwooddiaryblog.wordpress.com/ - and used with his permission. Yet it is still “not quite dark”; the sky to the west bears a faint wash of blue tinged with orange-pink. A Tawny Owl hoots in the distance; A Nightjar churrs from a yew tree, at the edge of the heath; a crisp silhouette - the origami and choreography are perfect - singing, floating off, swooping up and back; then another and a third - an enchanted performance ... And ... silver-washed tranquility. 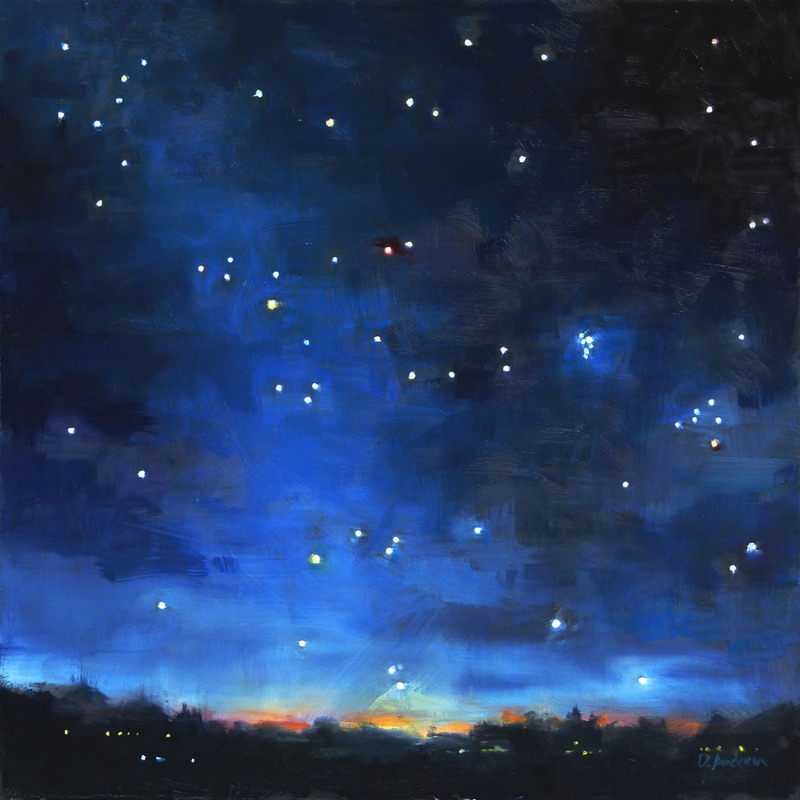 The featured image is of a painting by Deb Anderson - a 12"x12" oil on board painting of the Night Sky and the Seven Sisters ... She does beautiful paintings so her blog is well worth a browse - I especially like her night sky ones, landscapes and plants. Most of this post is about the birds I see and hear around home except for the Nightjar which although it breeds not too far away I have never yet got round to seeing. Thanks to Martin Smith for writing about them on his blog and allowing me to use his words. As we reached the moorings along the dyke near Horsey Mere the mist was already settling over the surface of the water leaving just the feathery tops of the reed tops swaying gently above. Soon we were wrapped in a grey cocoon. I imagined I heard the foghorn like call of a Bittern. Time for an early night. It's never quiet on a boat at night - the sound of little wavelets lapping at the hull, the creaking of deck timbers; the slap slap slap of a loose rope against the mast. I snuggled down into my sleeping bag. The last thing I heard was the ‘whinnying’ calls of Little Grebe. I woke with a start much later - not sure of what had woken me - then I heard it again - an eerie sort of scream - the rather un-birdlike calls of a pair of Water Rail. No hope of seeing them. I woke again not much later, it was just beginning to get light. I wriggled my way out of my sleeping bag and poked my head out of the forehatch. There was still a mist but thinning now. And then I did hear it quite distinctly the ‘booming’ of a Bittern in the distance. A bit of poetic license here as I’ve never seen or heard a Nightingale in these woods. They did occur in Flintshire in the late 1800s, early 20 Century, but we are at the very northern edge of their breeding range. I have listened to one at dawn, in a small Wood, at the edge of the Oxford canal back in the ‘80s - a beautiful moment and a treasured memory. What a lovely post. Are you writing from experience or imagination? Either way, it’s a wonderful read. I can picture the scene vividly, and I love the inclusion of the birdsong clips. I write a bit about music too, my other passion. But I am “obsessed with that bl**dy wood” to quote my wife. I’m told that my writing has leanings towards a relatively modern literary genre of ‘Creative Non-Fiction’.